Forró (fo-HOh) music makes its way from the Brazilian Northeast to the American Northwest. The rhythm, percussion, accordion, and bittersweet melody remind people of Cumbia, Brazilian Zydeco, and 'Salsa meets Polka,' but mostly, they just smile and dance! You don't need to understand Brazilian Portuguese to appreciate its beauty, let alone this five-flavor platter of tasty tracks. Portland, Oregon's z'Bumba brings the rootsy, raucous, and rebellious FORRÓ (fo-Hoh) music from Brazil's northeast to the American northwest. Full of percussion, accordion, and bittersweet melody, people describe the effervescent and superbly danceable music to Cumbia, 'Brazilian Zydeco,' and have even dubbed it 'Salsa meets Polka!' Whatever you call it, grab someone you like or think you might, hold them close, and let the music do the rest. Hopefully, you'll forget what 'puritan culture' means! z'Bumba is like nothing you've ever heard before. It's this triangle-driven, high-energy wave that will connect a circuit between your brain and your feet like an arcing electrical spark. Portuguese lyrics sung smooth as butter (I don't know what she's saying, but I know it makes me feel good), and a lilting accordion that at times will make you think of ancient, sleepy villages as in the song "Mousers of Moreland / Enxuga o Rato"... until once again that holy triangle kicks up the pace and the whole band jumps into the chorus... It's impossible not to dance, sway, bounce, smile with z'Bumba in your head... This five song EP is a great sampler of z'Bumba's musical range, from a raucous percussion fest to a gentle, melodic drifting. And did I mention the triangle?? 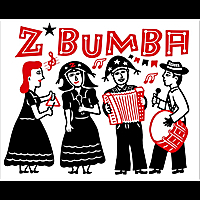 Forró is so much fun to dance to and z'Bumba is such an excellent band! I've been to see them perform several times and I was elated that they put together this EP! Seeing and dancing to their music in person is such a treat and this EP so excellently captures the sense of that. Finally I get to own recordings of some of their original tunes and also the crowd favorite, Magalenha. Believe me, you will enjoy the heck out of these songs, and if you EVER get the opportunity to go see them perform, your ears and your soul will thank you! This cd is going into heavy rotation at home, in my car, and on my ipod!